As is so often the case for a mind slowing down, things only acquire full sense and meaning after a fashion and only when made sensible and meaningful by attention to other things in parallel. 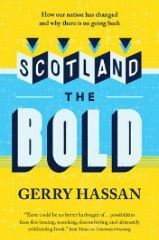 So it has been with my reading of Gerry Hassan’s stimulating most-recent book, Scotland The Bold (Glasgow: Freight Books, 2016). In parallel, in part prompted by topical and active critiques in the art school in recent months (my place of work) current meaning-enhancing reading material includes the excellent Institutional Critique and After, John Welchman (ed.). The crossover arrives from Hassan’s established work on new spaces for participatory debate. These spaces flourished within and drove from outwith the 2014 indyref. On this ticket Hassan has much to say of interest about long-standing and emerging non-elite modes of critical engagement, deemed by him and others ‘new forms of democracy and participation’. What with ‘Imagination: Scotland’s Festival of Ideas’ and ‘Changin’ Scotland’, as well as ‘Cultures of Independence’, as some examples, Hassan’s work on this front comprises detailed commentary as well as a magnanimous creative practice that generates opportunities for publics to participate in new forms and form them anew in so doing. Two upsides of Scotland’s referendum, were, firstly, undoubtedly, as Hassan notes once again, a burgeoning of these new forms and, secondly, perhaps more importantly, a burgeoning of the idea amidst and because of these forms that participation did not require elite pedigree nor permission from an elite. Note: this principle did not mean uninformed participation. New forms saw new participants; new participants saw new forms: both together see new ideas and impetuses. In Scotland the Bold, Hassan deploys ‘unspace’ as the term to describe the site and character of the nemesis of these new forms; the ubiquitous, the normative, the characterless and the lumpen non-progressive. Unspace ‘can be found everywhere in the world’. It is the site and character, ‘the power and mandate of institutional speak’. It is a force that ‘rewards certain modes of acting, talking and exchange, and disavows, marginalises and ignores other forms’. It has a ‘narrow range of permissible behaviours and frowns on spontaneity, frivolity, and informality’. New forms are challenges to the established patterns of Unspace, and offer loose ‘messy or fuzzy spaces’ by contrast to the rigid channels and behaviours of unspace. In chapter 9, Hassan tabulates contrasting characteristics of unspace and fuzzy space. Instead of the ‘institutionally-focused subjects and agendas’ of unspace, fuzzy space propagates ‘subjects and agendas that are value orientated’. Whereas discussions in unspace are filled with ‘jargon and buzzwords’, discussions in fuzzy space ‘mirror everyday conversations’. as for the upshots of discussions in both spaces, unspace predetermines them and ensures that they are ‘controlled by the power players’ with ‘very low or no ownership of outcomes and actions’, and, fuzzy space ensures ‘outcomes demand further engagement of participants’ and encourages ‘more collaboration and action’. All this Hassan describes not to hold us in a cosy historical paralysis but to speak up for the need for these new formations to be sustained and supported for the longer term. ‘We have to learn from the experiences’ of indyref ‘and talk about how to experiment, create infrastructure and develop new spaces’ while being mindful of the need to develop in tandem a pluralism to enhance the ‘ecology of DIY cultures’ at the heart of fuzzy space. In a sense, by way of my parallel readings in the not-always-not-unspace of contemporary art, fuzzy comes to be in Hassan’s bold book a signal of principles and tactics of what arties might classify as institutional critique. Art discourse will offer a forty or fifty-year old trajectory for Angloamerican Institutional Critique, kicked off as it was by creative distrust of duplicitous institutions on the part of legends like Hans Haacke and Michael Asher in the US and Marcel Broodthaers and Daniel Buren in Europe. Parallelly – the UK with its metonymical Westminster was the unspace bête noire for focused fuzzy institutional critique from indyref Yes (and some No) voters. These crossover readings remind us, then, that the new forms of engagement of artists like those just mentioned have for a long time since been concerned with deliberately messy and disruptive practices that would counteract the predominating forces of unspace and its agents. We know that from the lead and influence of these early protagonists arose a raft of strategies of engagement and informal DIY tactics beyond unspace institutions, relational strategies and participatory efforts fuelled by artists’ ambitions to loosen the grip of vested-interested, jargonned powerplayers. But before we subscribe to the unconditional wholesomeness and potency of fuzzy values and vehicles, let’s blog in two caveats; the first with reference to John Welchman’s intellectual overview of the tensions at work in Institutional Critique. One imperative of this caveat is that we must be vigilant about the actual quotient of critique and novelty resident in fuzzy responses to unspace, for absorption in Welchman’s sense is too readily available. This is the ‘echo chamber’ criticism levelled at much pro-yes sentiment. That Hassan can see this snare is evident in his observation that pluralism must be a watchword, and, moreover, ‘dissent…and the evolution of counter-stories have to be encouraged’. It would indeed be delusional to award unconditional plaudits to new forms of practice that replace one form of, albeit formal, enclosed affirmative unspace with another, albeit informal, enclosed affirmative unspace. During the last decade of biennial mania and super-commuting curators who package and reassemble a core of international artists in concert with homegrown quotient at a myriad roving locations, the contemporary aspect of the “museum” has been effectively re-calibrated as a global delivery system. Fuzzy can dazzle and camouflage the persistent presence of unspace motivations and it can flatter to deceive in terms of its impact on the institutions it has moved beyond. That said, it is too glib a counterpoint to propose that institutional critique is obsolescent in the neoliberal logic of accumulation and absorption. Hassan argues that the dynamism of fuzzy space as seen during indyref has already caused a shift in the axis of unspace in Scotland and he shares some persuasive specific examples of messiness in effective action. Caveats over, one final point in conclusion. Arguably the boldest point in Hassan’s latest offering, by virtue of what it means especially for cultural nationalists and strategists, is that whether at the national or individual level, identity and self are in flux and should be in flux. For if they are in flux we experience self-determination in a (literally) constructive fuzzy form, and a collaborative and coproduced (individual or national) self is offered as an antidote to the prescribed national self offered by the media office of unspace. The lumpen must be loosened, we all hope, by the loose lead of fuzzy space, and if achieved, in the long run, Scotland might be ambitious enough to recognise that how it does things with its people for its people might be as significant in future (indyrefs) as any purveyance of an existing agenda or narrative of divine national meaningfulness and/or destiny. The route to this lumpooseness is for the institution of whatever scale, my own included, to import apposite fuzziness as a common practice to counteract the pernicious and alienating effects of unspace. It would indeed be a bold prediction to estimate by when this might be a national characteristic but surely Hassan is right to venture that indyref set something in train in this regard that, because it did not originate there, cannot be put back in the museum’s storeroom.